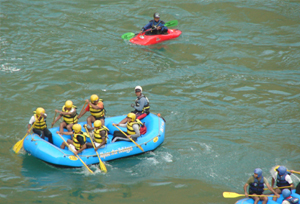 Rishikesh not only welcomes you with rafting opportunities, it also offers avenues for all-out adrenaline pumping action. After your arrival in the city, you are advised to get in touch with experts and instructors to chalk out a proper plan, keeping in mind the rapid grade level that matches your physical stamina and ability. The city and nearby areas have numerous “propulsion” points and one of the most popular ones among these is Kaudiyala. Kaudiyala is sought after by thrill seekers from all across the globe. 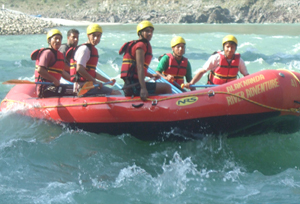 The stretch of the Ganges from Kaudiyala till Rishikesh, is replete with some of the world’s most fun-filled river rapids. This starting point is also the furthest one from Rishikesh. Therefore, expert advice is necessary if you’re willing to take the plunge from Kaudiyala. What to expect while on your trip? The 13 river rapids that fall between Kaudiyala and Rishikesh have been categorized into different grades, in absolute compliance with the international values. Rapids at this particular site, i.e. Kaudiyala are Grade III and Grade IV ones. These are earmarked as ‘difficult’ owing to the serious obstacles its course entails. Irregular rocks, waves and other paraphernalia may await you while you battle the gushing waves of the Holy Ganges. Also expect small challenges to creep up at unusual corners. An excellent exemplification of the aforementioned is ‘The Wall’. The Wall is a rapid where 90 percent of the raft boats are likely to flip over. In order for you to be able to enjoy this stretch along Grade III and Grade IV rapids, you must be within the 20-35 year old age bracket. The Kaudiyala stretch also states prior experience of up to 3-4 times as a pre-requisite. In addition to that, the boat operator must be a qualified swimmer, also adept at river rafting techniques. A decent level of physical fitness is a must.